Rapid developments in digital image processing technologies ensure effective image distribution across the regional, local, and global level. The vastly improved capacity of the Internet and the speed of transmission have permitted a much wider use of teleradiology, with centers across the world providing day-time reporting for out of hours imaging services in other countries with different time zones. The changing face of interventional radiology across the globe and rise in prevalence of chronic diseases such as cancer and coronary heart diseases boost the number of radiological procedures. The need of time-saving interpretation of radiographs with quality is high in developed economies where incidence rate of chronic diseases is rising at a rapid pace. In order to keep pace with the rising demand for radiological procedures and comprehensive interpretation, teleradiology is being preferred by health care providers across the globe. The global teleradiology services market was valued at US$ 4.6 Bn in 2017 and is anticipated to reach US$ 21.8 Bn by 2026. Rise in incidence of chronic conditions and adoption of teleradiology propel the global teleradiology services market. Chronic diseases are one of the major health care concerns across the world. Hence, increasing incidence of chronic conditions such as cancer, cardiovascular diseases and others chronic diseases likely to drive the market in coming years. However, stringent government regulations and lack of skilled professionals in developing countries are the major factors restraining the market. The global teleradiology services market has been segmented based on services type, coverage, specialty, modality, end-user, and region. In terms of services type, the general reporting segment is anticipated to account for around 55% share of the market. Rise in demand for precise and accurate diagnosis of radiology procedures such as CT and MRI is projected to boost the growth of the segment from 2018 to 2026. Based on coverage, the market has been classified into day time and after hours/night time. The afterhours/night time segment is anticipated to expand at a relatively higher CAGR in terms of revenue during the forecast period. Based on specialty, neurology was the leading segment in 2017 and is likely to account for major market share during the forecast period due its complexity and difficulty in reading, as it requires highly specialized radiologists to read neurology scans. 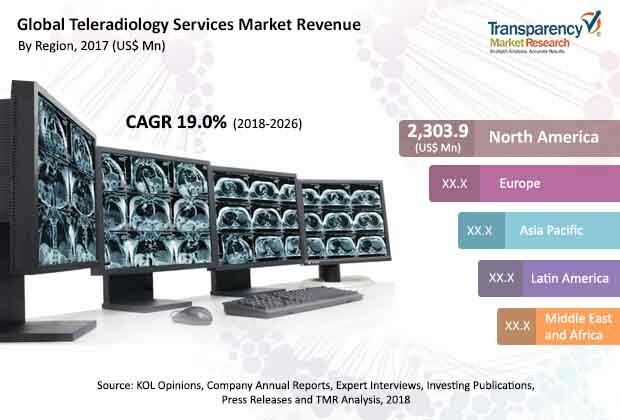 In terms of modality, the computed tomography (CT) segment held 30.0% share of the global teleradiology services market in terms of revenue in 2017. The segment is driven by increase in research and development in mobile medical imaging systems and ability of these systems to enable patients to take diagnostic images from smartphone and share it with physicians. Diagnostic imaging centers is the major end-user of teleradiology services, accounting for 35% of market share in terms of revenue, as diagnostic imaging centers offer a one stop shop for all imaging requirements, making it a preferred choice for patients. The global teleradiology services market has been segmented into five major regions: North America, Europe, Asia Pacific, Latin America, and Middle East & Africa. In terms of revenue, North America dominated the global teleradiology services market in 2017, accounting for 50.0% share. High share of the region is owing to large number of leading players located in the region, highly developed health care infrastructure, increased awareness among patients, and continuous evolution of information technology. The teleradiology services market in North America is likely to expand at a moderate CAGR during the forecast period. The market in Asia Pacific is projected to expand at a higher growth rate in terms of revenue from 2018 to 2026, due to rise in awareness about teleradiology services among small scale health care facilities and increase in adoption of technologically advanced digital platforms. Key companies operating in the global teleradiology services market and profiled in the report include Envision Healthcare Corporation, MEDNAX Services, Inc., 4ways Healthcare Limited, Euro American Tele Radiology, Argus Radiology, Teleradiology Solutions, American Imaging Consultants, USARAD Holdings, Inc., ONRAD, Inc., Teleconsult Europe, Africa Telerad Limited, and Unilabs. This report studies the current as well as future prospects of the global teleradiology services market. Stakeholders of this report include companies and intermediaries engaged in the provision of teleradiology services, and new players planning to enter the market. This report comprises an elaborate executive summary along with a market snapshot providing overall information of various segments considered in the scope of the study. This section also provides the overall information and data analysis of the global teleradiology services market with respect to the leading segments based on services type, coverage, specialty, modality, end-user, and region. The teleradiology services market report comprises an elaborate executive summary, which includes a snapshot that provides information about various segments of the market. It also provides information and data analysis of the global market with respect to the segments based on services type, coverage, specialty, modality, end-user, and region. A detailed qualitative analysis of drivers and restraints of the market and opportunities has been provided in the overview section. Additionally, the section comprises competitive matrix and company profiles with business overview to understand the competitive landscape in the market. This section of the report also provides market attractiveness analysis by region and market share analysis by key players, Thereby presenting a thorough analysis of the overall competitive scenario in the global teleradiology services market. Based on services type, the global teleradiology services market has been classified into general reporting, consultation, auditing, and others. The general reporting segment is projected to account for significant market share in terms of revenue in 2018. Dominance of the segment is attributed to rise in demand for time saving and cost-effective radiograph interpretation by health care providers across the globe. In terms of coverage, the global market has been bifurcated into day time and after hours/night time. After hours/night time is projected to be the most attractive segment during the forecast period. Based on specialty, the global teleradiology services market has been divided into cardiology, neurology, musculoskeletal, gastroenterology, oncology, and others. The neurology segment is projected to lead the teleradiology services market in 2017. In terms of modality, the global teleradiology services market has been classified into X-ray, ultrasound, magnetic resonance imaging (MRI), computed tomography (CT), nuclear imaging, and others. Based on end-user, the global teleradiology services market has been categorized into hospitals, diagnostic imaging centers, ambulatory surgical centers, clinics, and others. Diagnostic imaging centers are sustaining strong growth propelled by joint ventures, acquisitions, and provision of all imaging services under one roof. Each of the market segments has been extensively analyzed based on market-related factors such as rise in adoption of services. Moreover, historical year-on-year growth has been taken into consideration while estimating the market size. The market size and forecast in terms of US$ Mn for each segment have been provided for the period from 2016 to 2026. The report also provides compound annual growth rate (CAGR %) for each market segment for the forecast period from 2018 to 2026, considering 2017 as the base year and 2016 as the historical year. The overview section of the report explores market dynamics such as drivers, restraints, and opportunities that currently have a strong impact on the teleradiology services market and are likely to influence it in the near future. Market attractiveness analysis has been provided in the overview section to explain the intensity of competition across different regions. The competitive scenario among various players is evaluated through market share analysis in the competitive landscape section of the report. All these factors are expected to help market players take strategic decisions to strengthen their positions and increase share in the global teleradiology services market. Geographically, the global teleradiology services market has been segmented into five major regions and the key countries in the respective region: North America (the U.S. and Canada), Europe (the U.K., Germany, France, Spain, Italy, and Rest of Europe), Asia Pacific (India, China, Japan, Australia & New Zealand, and Rest of Asia Pacific), Latin America (Brazil, Mexico, and Rest of Latin America), and Middle East & Africa (South Africa, GCC Countries, and Rest of Middle East & Africa). The market size and forecast for each of these regions and the mentioned countries have been provided for the period from 2016 to 2026, along with their respective CAGRs for the forecast period from 2018 to 2026, considering 2017 as the base year. The research study also covers the competitive scenario in these regions. The report also profiles major players in the global teleradiology services market based on various attributes such as company overview, financial overview, product portfolio, business strategies, and recent developments. Key players in the market are Envision Healthcare Corporation, MEDNAX Services, Inc., 4ways Healthcare Limited, Euro American Tele Radiology, Argus Radiology, Teleradiology Solutions, American Imaging Consultants, USARAD Holdings, Inc., ONRAD, Inc., Teleconsult Europe, Africa Telerad Limited, and Unilabs.